Andrew G. Benjamin writes via canadafreepress.com: Let’s have “an intelligent conversation about guns.” You speak about “gun violence” at every turn. You and the President remind us about “a gun epidemic.” That’s the gun epidemic that, according to statistics from the FBI, cut violent crime across this nation to one third of what it was under your husband‘s tenure. 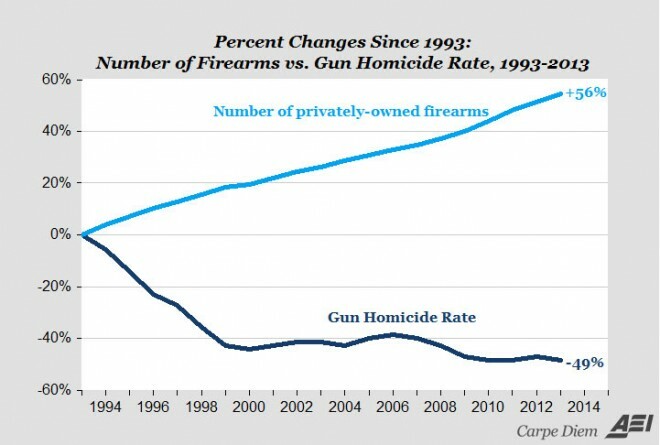 It was the decline in gun violence after firearms laws were rapidly being liberalized and many states adopted “shall issue” pistol permits. The only epidemic Madame Clinton, are people buying guns legally in fear of your ultimate goal of confiscating the very first human and civil right of self-defense. Meanwhile, neither you nor the president have ever made an effort to confiscate the guns of thugs on the streets of Obama’s home town¬†—as your party opposed frisk laws and supported Black Lives Matter, members of whom are shooting, in addition to each other, innocent law enforcement officers doing their job on the streets. You talk about background checks, as if gun buyers in this nation can buy a gun without background checks. No, they cannot Madame! No dealer will sell a gun without permission from the FBI. Only the thugs you have supported buy guns without background checks. When you speak about gun violence, you never speak about the gun violence killing the innocent voters in the communities who back the two of you. You see, legal gun owners are not shooting each other in the suburbs. You want to have “an intelligent conversation about guns?” Well Madame secretary, I also want to have an intelligent conversation about guns, so let’s have one. Dear Madame Clinton, Honorable President Obama. Was that conversation about guns intelligent enough for you? When your opponent foolishly digs themselves into a hole you do NOT advise them to stop digging. The proper thing to do is find a shovel for yourself and start putting the dirt back in on top o them. That picture makes my stomach hurt, the witch and such a waste of walnut and steel. It’s ugly in so many ways. I like to pretend that it’s all salt wood, and that way we’re protecting other guns from it. It is the unvarnished truth, but they always have, and always will, ignore it. It doesn’t fit their agenda, so why should they acknowledge their shortcomings? You are politically “urinating into the wind”. These Socialists/Communists will never admit to the failings of their attempts in “social engineering”. They are self-serving, egocentric, greedy, money grubbing Fascists that cloak their agenda in the guise of “pseudo compassion”. This is done while laughing up their sleeves at the “ignorance” of the “inferior” population. Their attitude has been around since the days of Marie Antoinette… “Let them eat cake”. Point of order: Marie Antoinette never actually said “let them eat cake”, but everything else you say is spot on. Love them moon shaped biscuits…. So tell us how you really feel. Numbers are numbers, facts are facts, more people die under dems then republicans. At least to “mass shootings”. Lets face it the dems drive everyone insane! When Wikileaks dumps the goods we may see how Madame Crazy Eyes simply ‘ overlooked ‘ background checks for selling weapons to IsiL …… but hey , that’s different ……. riiiiight …????? You’re not current in the news today. If wikileaks is as smart as they seem to be, this just means they’ll now release on Monday and catch everyone by surprise. Ah-ha! You never expect the unexpected! That woman, Hillary Clinton will ignore anything including incontrovertible that does not fit her narrative. If she should somehow manage to succeed in fooling enough low information voters into voting for her she will do her best to destroy any portion of the Bill of Rights that she finds inconvenient. First up on her list for destruction for the good of the state: The Second, followed by the Fourth, and then the Fifth. my narrative won’t fit in an incontrovertible unless i leave the top down. I disagree. I’m certain she has the 1st Amendment slated to be dealt with after the 2nd Amendment. We haven’t had free speech in any form since Obama was elected. Many forms were dead long before that. The 4th & 5th died with the “Patriot Act” and it’s more heinous cousin the “Freedom Act” which expanded all provisions of its predecessor once it expired. PC only makes a difference to people with no spine to start with. In order to have a constructive conversation both sides have to openly admit what their goals are. Liberal’s goal isn’t to stop crime, there is ample evidence that they don’t actually care about crime. The goal is disarmament of the populace and they will use any lie they can to achieve that. What exactly their end goal is I don’t pretend to know but I doubt it’s anything to our benefit. The ‘End Goal’ is total civilian disarmament. Except for them, of course. I don’t see civilian disarmament as the end goal. It certainly wasn’t the goal for the Russians, Chinese, Cubans etc. Basically enslavement was the end goal and disarmament was merely a prelude to that. It seems you have answered your own question, grasshopper. Huh, a maple that supports armed self defense and loathes Hilliary. I haven’t seen that before. Btch, you so full of sht, even Canadians be callin’ you out on your “gun volience” BS. Canadians. Where is the 1911 safety story? I get a page not found when I try to reply. Was there an announcement about why it got pulled? It was sparking a lot of debate, but nothing bad, last I looked. Not that I’ve seen, but who knows? Sometimes stories get deleted when the comment section gets too uppity. In this case you can probably blame me. I gave RF a mild admonishing for carrying a rig he feels he needs to handle with special extra steps to be safe and it sorta started a huge argument with other commentators about carrying a gun with the safety on vs off, what’s actually safe and whatnot…. so yeah, probably my bad. I can only speculate on why – I think it should have been pulled or had an addenda to clarify. He was advocating a potentially unsafe practice, and recommended training said practice in a manner that would build a training scar, so that may be why. The safety should remain on until you have an acceptable sight picture – which can be obtained once your pistol is at the top of the draw and pointed at your intended target. This can be very early in the press, or it may be later in the press, but the safety should not be coming off until you start the press. If you’re training to disengage the thumb/frame safety once you clear the holster, that is not OK on a 1911, particularly if you must fight and move with others – which means you would be moving in close proximity to your teammates with a hot pistol that has the shortest trigger takeup known to man with the safety off. Furthermore, the previous is an entirely plausible scenario in a DGU. We all have to identify any flat range mindset we have, reject it, and perform enough quality reps to overcome it. This feeds into an interesting conversation I had with a coworker last week. While he is fine with handgun sales, as homicides have dropped over time, he points to the number of mass shootings as evidence why the AWB worked and needs to be reinstituted. The outcome of the discussion was….unchanged from opinions entering it. It was an interesting lesson that, even more than presidential politics, everybody has a position and it isn’t going to change. The best any of us can do is to hold the status quo while looking for incremental progress as the less dedicated are distracted. Really, Colin Kapernick was the best thing to happen to gun rights, if we were willing to embrace the liberal focal shift instead of attacking there as well. Use minority rights as a springboard for an opening to loosen something we want – not unlike what we could have done during the gay marriage debate when we could have sought universal reciprocity as part of all state licenses instead fighting another battle. If those other points are more relevant to you, then fight those battles. Otherwise, consider the squandered opportunity. So he somehow does not realize that semi-automatic rifles existed before the AWB? +1 on everything except stop-and-frisk because I believe in the 4A just as much as the 2A. If officers have reasonable suspicion, then cool, go ahead an pat down for your safety. Stop-and-frisk could eliminate crime by 100% and I would still be opposed to it. Such is the cost of living in a free society. Your mom wants her ipad back… She says you need to brush your teeth and get in bed… You have school in the morning…..
Do we really need Frogs splashing ink on our behalf? No thanks we’ll pass. When the time comes, America will make piles of brass, and we won’t aim at Eskimos, Blacks, Asians, Europeans, Muslims, Southern Baptist, Arabs, Gays, transgenders, Whites, business owners, welfare recipients, anti gunners or hunters. I hate to be a party pooper, but you guys aren’t thinking like illogical liberal progressive anti-gunners. The chart “totally” supports the need for a new AWB. Here is why: AWB was signed by Clinton, mass shootings are low through Bush 43. AWB ends during Bush 43 term. People stocked up on AWB’s for $599 at Walmart (that’s where I got my DPMS Panther), later mass shootings explode under Obama. Clearly its George Bush’s fault! Never mind the “Ferguson Effect”, “Police act stupidly” per BHO, the lack of Federal law enforcement and the fact very few murders are committed with rifles at all. You got me! I couldn’t even tell I was a racist! Damn! If your dumb enough to believe an intelligently written open letter will change that evil woman’s mind, your probably dumb enough to have emailed it to her as well. That’s 20 minutes of your life completely wasted. I didn’t know she was a Madame! Another illegal activity she’s been involved in? There is no epidemic of gun violence across this country (although Chicago is a disaster zone). Here are the trend lines. C’mon guys!, The real truth about anything is not the real truth unless “She” says it is”. If this were 1693 Salem, Hillary would already have been hanged for practicing witch craft or just blatant lying.